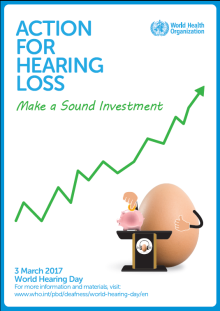 March 3rd is World Hearing Day and The World Health Organization are drawing attention to the economic impact of hearing loss in their report “Action For deafness: Make a sound investment.” The report estimates that unaddressed hearing loss costs economy across the globe a whopping $750 billion annually. It reveals that unaddressed hearing loss puts significant costs on healthcare system, other than the cost of hearing aid devices and to society due to social isolation, communication difficulties and stigma globally. It also reveals that there is significant loss of productivity due to unemployment and retirement as well as the additional costs that are required in education to support children with hearing loss. Whilst in the UK we have good access to free audiology services in the UK and the option of private audiology services, the picture is quite the opposite in other countries across the globe with little or no access to audiology services at all. More needs to be done to raise awareness of hearing loss and the urgent need for audiology and ENT provision globally. We want to highlight and celebrate the great work of many volunteers working within audiology abroad to support projects that have been established to try to fill this void. As you will see, we’ve started to add volunteer stories to the Global Outreach page, but we know that there are lot more volunteers and NGO’s out there who are doing great things and making progress globally. Do you want to fundraise for Global Outreach?